Silver Creek Press Blog: Managers can be targets of harassment by employees! Managers can be targets of harassment by employees! The team is not very productive and has internal conflict. Ongoing coaching support for the manager by senior managers or external coach or consultant. Addressing employee performance/behavioral issues (unprofessional behavior, back-stabbing, confrontational attitude, lack of attention to job duties) using feedback, warnings and dismissal when other strategies fail. Insisting on respectful communication and interactions by everyone. Reporting of infractions to senior managers who must take swift action to discipline or dismiss employees involved. This is a case of “you get what you tolerate”. Setting no limits means the situation will deteriorate. 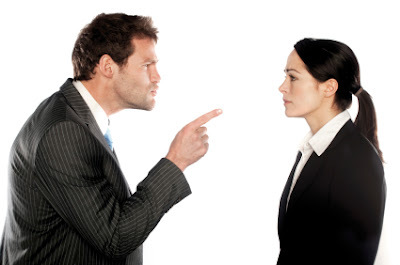 Being direct and decisive may trigger complaints by the bullies to senior management. However, being firm, consistent, calm and confident in your role and you will no doubt win the battle in the long term. While you move forward to create a healthy happy team, there is bound to be some impact on your stress level, mental health, sleep or physical well-being. Self-care is crucial - this is not a sprint, it is more likely a marathon. No job is worth your own well-being or the well-being of your family. If you are not making positive progress in three months consider asking for a transfer, request senior managers address the situation directly or, if necessary, start looking for another job. Remember the Serenity Prayer? It takes serenity to accept the things you cannot change, courage to change the things you can, and wisdom to know the difference.